A French Perspective » Beauty & French fashion » What are the French make-up secrets to look natural? French is all about simplicity, or so we, French, want to believe. Indeed, French women tend to dress simple yet elegant and we all know how discreet they keep their makeup on a daily basis. It is even frustrating to acknowledge their allure and beauty when proudly showing such a “oh I’ve just got out bed” radiant look. Well, let’s face it, French do have if not the best, top notch beauty brands. From the most glamorous and miraculous make-up products to the latest organics daily must-have, French laboratories do know how to do things the right way. And after all, I think that is the real secret: quality, doing things right. Indeed, I have, myself, tried and been addicted to all these miraculous products, that promise (and deliver) results over night, that can transform your look in 3 minutes and yes, they do, but for how long? To me, all these aggressive and promising beauty products end up damaging your skin and hair and it is not worth looking fab once to pay the consequences later. But as much as I believe in organic and natural products, I need my touch of miracle in my beauty products so I tend to use good quality products and use them consciously. So, if you were wondering how French woman do to stay young and natural, it is maybe worth you stop believing there is a secret formula because there is none. Beauty comes with a good care routine: use gentle good quality products on a daily basis, do not overload your make-up, do not use fake and aggressive face products, remove your make up religiously before going bed, hydrate your skin, eat well, sleep well, love yourself. Of course, there are thousands and thousands of natural and good quality products (French and not so French) I could recommend you to stay beautiful but basically if you keep a regulated beauty routine and you have a healthy life-style you are on your way! Pas de secret! Ok, we are doing the right things and we are definitely trying hard but we need this boost of confidence that comes with a nice make-up ritual in the morning. I personally never ever leave home without make-up on. A nice and discreet make-up can help us feel confident, beautiful and peaceful all day long: at work, with friends, at meetings, at home, etc. These are my favorite skin make-up that give me this natural look without letting me down. I have tried almost all the brands you can possibly buy at Boots and even at Selfridges. I started wearing foundation at age 15 in France, just in order to cover some red spots that would appear with stress or weather changes. So I have, a fair amount of practice behind me. Although I am still on the search for THE perfect foundation, for now, these are my essentials that do a fabulous job: they cover, they stay with me all day long, look natural and protect my skin just the way I love! 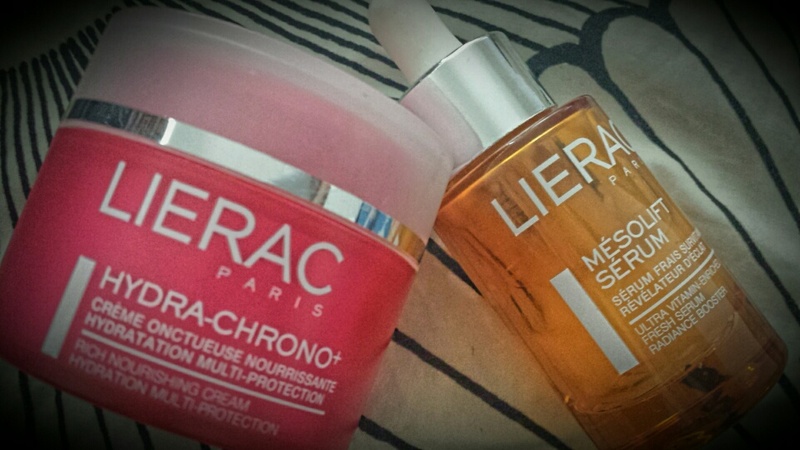 I trust Lierac. They offer a wide range of high-quality affordable creams and serums that would do magic to your skin. For a regular skin-type use the basic “Hydra-Chrono”, it nourishes intensively and protects your skin, I think it is ideal all year round. Always have 2 base creams with you: the oh so trusted moisturizing cream that you apply religiously every morning (and even night) after gently washing your face (I also spray spring water like Avene, before applying my cream) and a serum for some boosting. Your skin will tell you when it needs a change. I love the “Mesolift Serum” that gives me a radiance boost when my skin feels tired or greasy. It is like an injection on vitamins and glam. Although most make-up artists recommend to use a foundation brush, I follow the old-school technique as I love the precision of my fingertips. You can work the texture and melt it properly into your skin, but this is my personal choice, nothing else. My favorite foundations are “Clinique. Even Better”, “Lancome Teint Idole Ultra” and “Yves Saint Laurent. Teint Resist”. 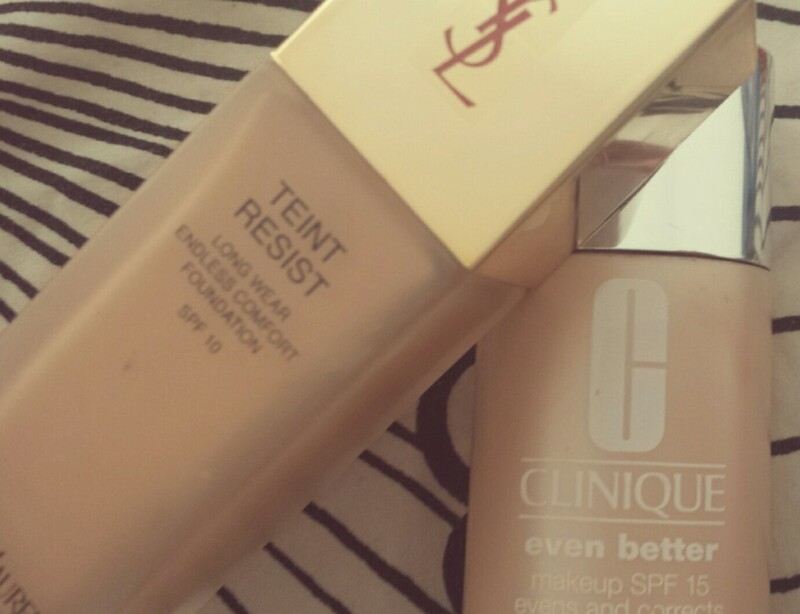 All of these foundations cover all imperfections, resist all day long but still look totally natural. I also love the fact that they protect your skin but have a matt finish that leaves your skin oil-free and very smooth. I always choose matt finish foundations purely to avoid this greasy feeling you tend to get after some hours. Also, silky foundations tend to go away or mark your wrinkles after a while. These foundations can be worn without powder or blush, they set very well, make you look radiant and won’t let you down. So whenever I am in a rush, I just wear my foundation and I am ready to go knowing I will look great. I would say that “Clinique. Even better” is the most covering of all, and the rescue foundation you should always have around, especially if you encounter skin problems or after a sleepless night. “Lancome. Teint Idole Ultra” is my every-day favorites it is very easy to apply, dries immediately, looks very natural yet sets up and stays all day long. “Yves Saint Laurent Teint Resist” is just beautiful. It is very similar to the Lancome one in terms of texture and results but I keep the YSL foundation for more special occasions purely because it is a bit more expensive, otherwise I would wear it every day! One tip, always chose a light foundation color if you are planning to apply a foundation powder on top. For a natural look and radiant finish, wear a slightly light foundation and then build up the tone with a darker powder, divine! I will recommend to apply the foundation powder only if you have a special occasion and you want to make absolutely sure you look extraordinary all day long. My recommended foundations don’t need extra powder, and it is not good no overload your skin, remember your skin needs to breath. Personally, I apply powder when I feel I look “terrible” or I have a public speech or clients’ presentation. I always carry these powder cases in my hand-bag, they are just perfect for touch-ups as they cover really well and look natural: they are my secret weapon! 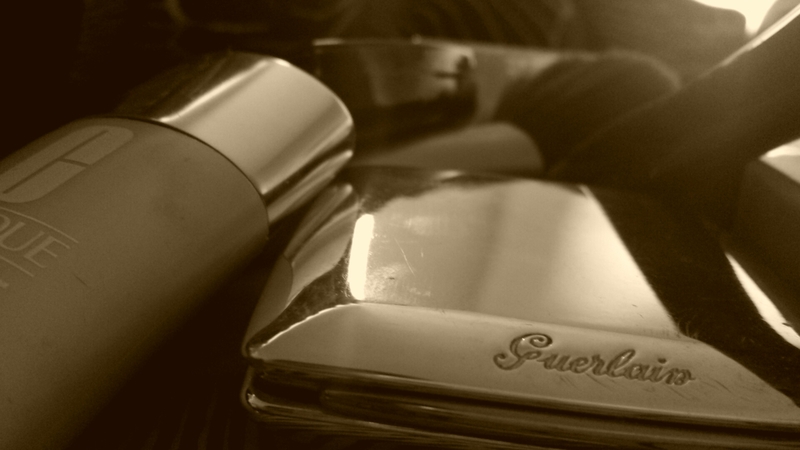 I must tell you about my top 3 foundation powder, as I cannot make a choice between the 3: “Guerlain. Parure” “Lancome. Teint Idole Ultra” and “Mac. Studio Fix”. They all cover and leave you with a smooth, natural look. 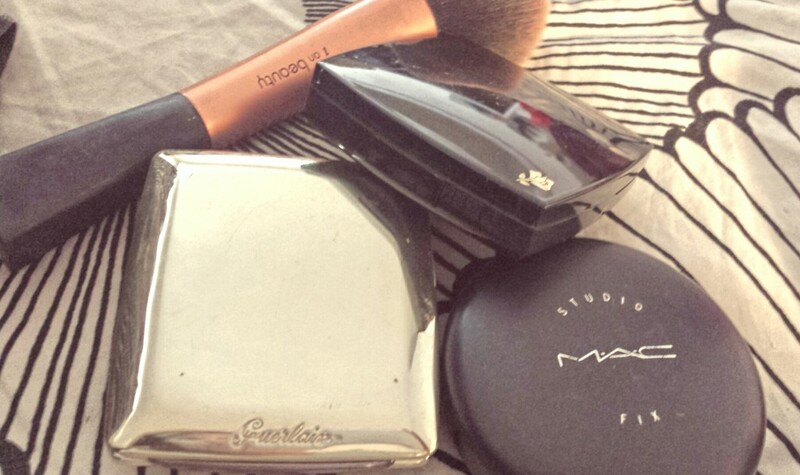 You can ever use them without foundation underneath when you are in a rush! Like all foundations, they come with a SPF 15 protection, so I would recommend to never leave home without at least, some powder foundation in order to protect your skin against aging and UV. “Guerlain Parure” is a divine treat that transforms your skin tone but it is not totally covering, use it more like a beauty boost. “Lancome. Teint Idole Ultra” does the job and it does it well, it is medium to high covering yet very natural and matt, it is a faultless allied. “Mac. Studio Fix” is the ultimate covering powder. This is definitely the powder that covers the most and leaves no room to defaults, actually this is the only powder I will wear with no foundation underneath. Just be careful not to over wear it as you can very quickly get the “cake-face” effect. French women I know all agree the most important part of your look is your face skin. So if you are in a rush in the morning, just follow my 3 steps to look fresh, impeccable and radiant all day long! French ladies, even at work, tend to only wear a very good foundation combination and they are not as found of blushes and bronzing powder. Since I work in London, I must admit I use bronzing powder on my cheeks and nose on a daily basis, when back in France I would only apply then when going for a diner party. I guess I am getting the London look! 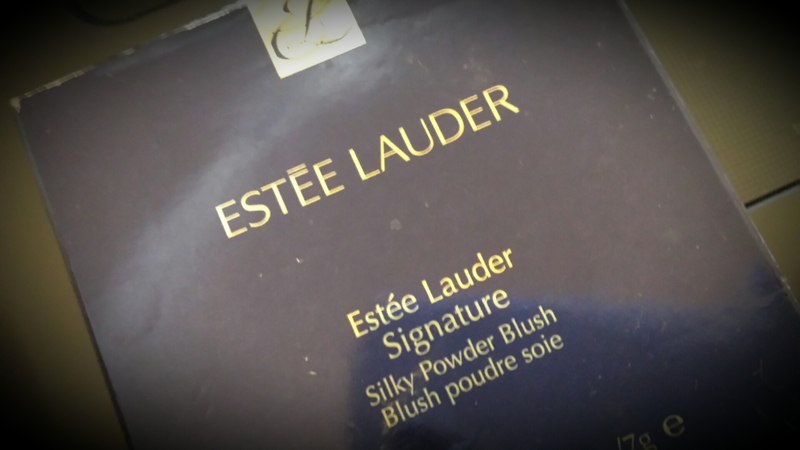 My favorite blush at the moment is “Estee Lauder. Signature” which is a discreet yet very glamourizing silky powder blush. One tip, if you do not carry a blush or bronzing powder, just use your powder foundation and, with a smaller brush, focus on your cheeks and desired zones to make them darker! Well, now you know my basic 3 steps I follow on a daily basis when I get ready for work. When I go out is a totally different story!! Follow me for more make-up and beauty tips from a real French Perspective ! Tagged beauty secrets, French beauty, make-up.